A new comic book bringing the story of King Robert the Bruce to life is to be launched in Fife this month. 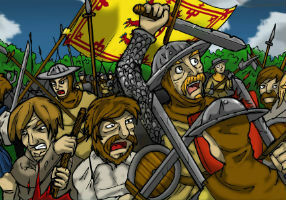 Creative students at Fife College have created a new website, comic book and film to mark the 700th anniversary of Bruce’s victory at Bannockburn. The comic book is being released on March 22 at Dunfermline’s comic book store, Little Shop of Heroes, with creators Fife College tutor Colin Maxwell and former student Michael Philp signing copies and a special guest – King Robert the Bruce himself – also due to make an appearance. Digital Media lecturer, Colin Maxwell said: “This has been a great project for the students to get involved in which makes good use of their skills and challenges their creativity. King Robert the Bruce was an extremely well known historical figure, and although most will know his name not everyone will know the story behind the man. The comic book signing takes place on the first day of a series of events in Dunfermline that mark the anniversary of the coronation of Robert the Bruce on March 25. With Dunfermline Abbey being the burial place of King Robert the Bruce’s remains, lecturers at the college decided to set students some creative assignments as part of a project backed by Visit Dunfermline. 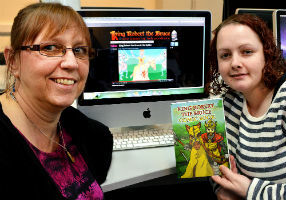 Deborah, along with Diane Rowley (25) from Ballingry created the animations depicting events in Bruce’s life which are showcased on their website www.kingrobertthebruce.com. Several video games were also developed and students took part in testing the games. The project culminates with the launch of a film which portrays Robert the Bruce in his old age looking back on his life, and tells his story through a mix of live action and animation. The film, which is due out in June, is aimed at younger audiences and can be used as an educational tool in schools.